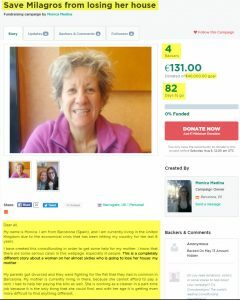 I am Monica and I have created this crowdfunding in order to get some help for my mother. Her name is Milagros and she is about to lose her home. After my parents got divorce, they have been fighting for the flat that that both of them own in Spain. Because of that, they have been through a trial (involving all the expenses spent in lawyers, etc.) and as a result of the trial they are going to sell the flat and split the money gained with it. 1. The real price of the flat is much less than expected. 2. With half of the money she will get, my mother will need to pay the lawyer expenses and probably try to rent a flat because she cannot afford anything else. Eventually, she will end up spending all the money obtained from the sale. 3. I am paying most of her bills, since she cannot afford to do so. In summary, she is going to need some extra help. This is why I am asking for some aid here. Even if it is 1€, it will be much appreciated. Thank you for reading this and if you can, please share this campaign.